Welcome, Maharanis! 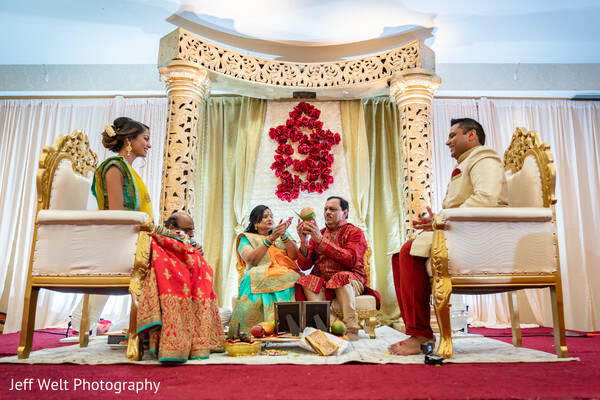 Today we have a ravishing and quintessential Indian wedding coming all the way from Edison, New Jersey. 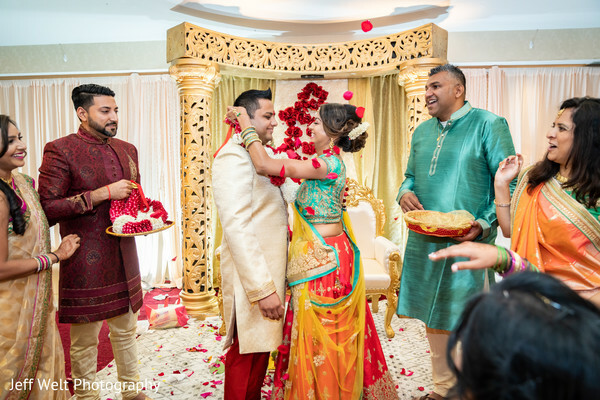 It didn't take long for us to realize the love between Maharani Gunjan & Aashish, so we knew immediately this featured wedding was going to be a hit. 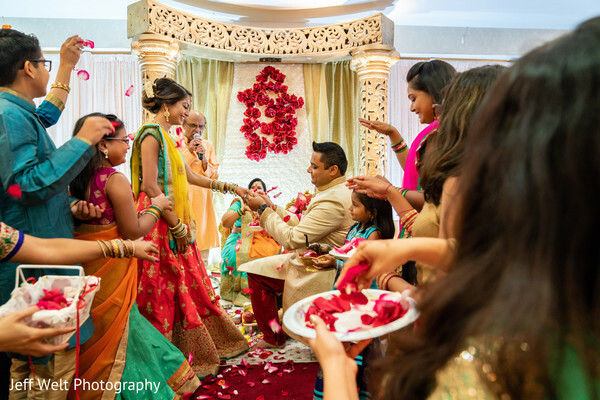 First, for the morning ceremony, the beautiful bride wore a stunning colorful lehenga with turquoise green and a beautiful lemon yellow dupatta. For the evening ceremony at the elegant Mirage, she chose to wear a custom made navy blue gown with golden embroidery, thanks to the hard-working hands of Leharr Collection by Chetna Ranat. Just so delightful! The entire ensemble was set up beautifully! The beauty experts from BEAUT by FAR are absolute professionals when it comes to hair & makeup artistry so Maharani Gunjan put the entire celebration in the hands of this beauty magicians. Raja Ashish couldn't believe his eyes! 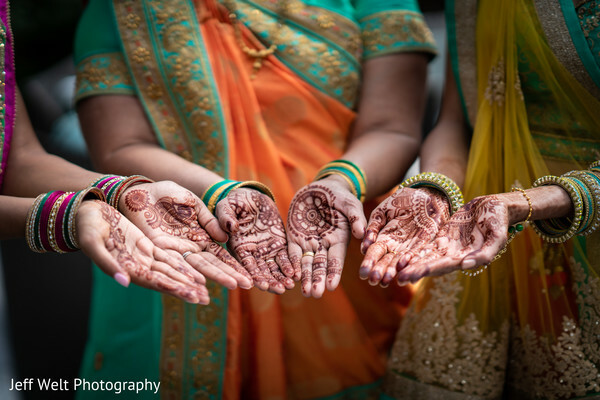 Jeff Welt Photography captured every single moment of what sure was, a magical day. 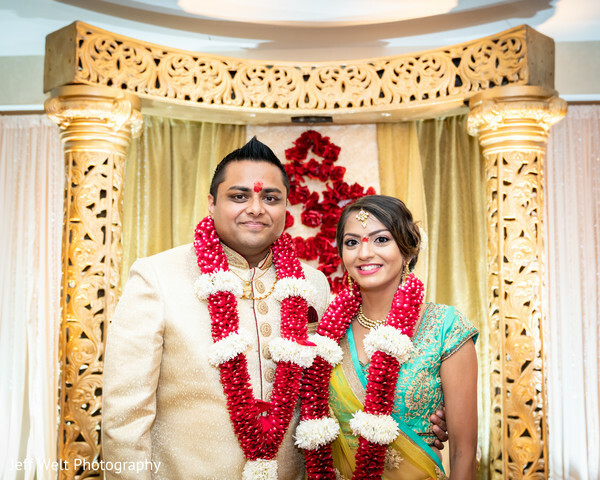 Still not enough of our couple's dream wedding? Dive into our gallery and see all the splendor for yourself! We both attended the same Alma Mater, University at Buffalo and through mutual friends we started talking and the spark started when we met each other in person on a summer day. As I approached him, with the feeling of excitement and butterflies in my stomach, I saw him holding flowers and the sweetest smile. From that moment, our love story began. Aashish and I were taking a trip to Punta Cana in Spring 2018. I was so sure as well as everyone else that he would be proposing on our trip in paradise. I had the perfect outfit, the perfect makeup, and nails and was patiently waiting every day for the big moment. To my disappointment, he did not propose to me there. Two months later, on a hot summer day, Aashish persuaded me to accompany him to a Pharma conference on Governors Island, N.Y. or at least that’s what I had thought. Prior to, I was in NYC attending my cousin’s graduation party and was not prepared to think I would be engaged as well as not having the attire to attend a conference. I had borrowed a blue dress from my cousin, my mother in law’s purse, and an antique piece of jewelry. As we walked through Governor’s Island, Aashish did not seem serious about his conference which started stressing me out. Until we reached Outlook Hill, the highest elevation on the island overlooking the entire bay of beautiful NYC. With the intense heat and my frustration building, I turned around and saw him on one knee asking me to spend the rest of my life with him with the most gorgeous diamond ring. Of course, I was caught completely off guard and surprised, with the same butterflies I had the first time I saw him. At that moment, I said YES! And I finally had something blue, something old, something borrowed and something new. We contacted a wedding planner to get a general idea of a checklist that would be required for our engagement. From choosing a date as the first important item to smaller but important details as well. 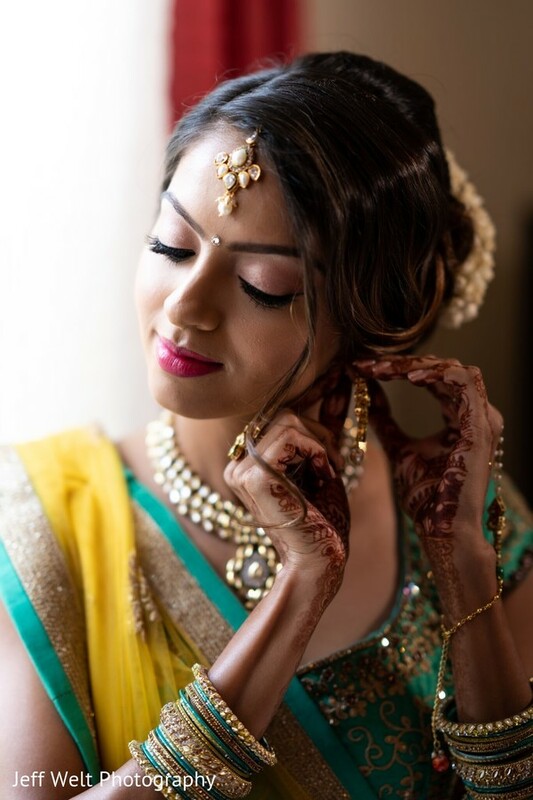 Maharani Weddings also gave us a comprehensive list of venues, hair & makeup artists, DJs etc. We began contacting and making appointments with all the vendors we were interested in. As the weekends passed, our exhaustive list was becoming complete. As we neared to the end of our list, we saw our vision and hard work become as true as we imagined. The photographer was the best friend of my fiance who did an excellent job. His professional, respect and dedication made our event as memorable as we experienced it. For the morning ceremony, I wanted to wear summer colors. 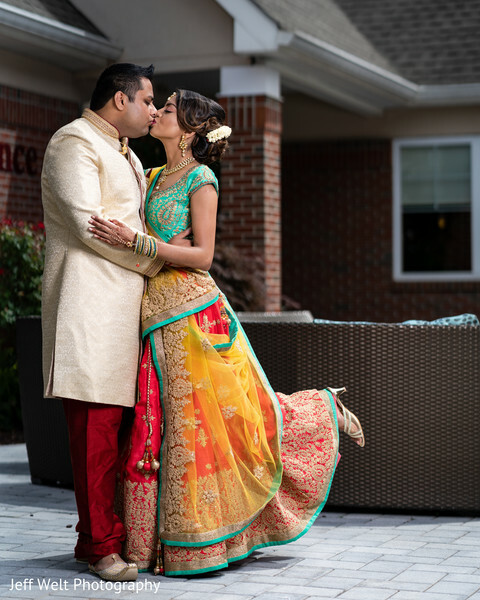 So after many unsuccessful shopping trips around NJ/NYC area, I found this gorgeous coral pink/ blood orange lehenga with turquoise green with a beautiful lemon yellow dupatta via a facetime shopping session from a store named “Wedding” from Surat, Gujarat, India. For my evening outfit, I had found this gorgeous navy blue gown with gold embroidery on Pinterest. I looked for it everywhere but was not able to find this in any store. I came across Lehaar collection, from one of my best friends. Chetna Ranat and her team from Lehaar collection was able to create an outstanding lehenga based on one picture. The best part was that she involved me in every step of the way. I was involved in picking the fabric, deciding on the color shade to finalizing embroidery design. I was stunned at the final product. Absolutely loved it. I had asked my fiance what part did he enjoyed the most during our planning and as the romantic he is, he had said: “Spending every moment with you, whether your angry, happy, sad, and hopeful”. They enjoyed the food and the details to decor and color, but most of all they loved dancing away til past midnight, they loved our DJ and the fact he kept everyone so well entertained and on their feet, they just couldn't come off the dance floor. They kept asking for more and stayed past the nights end. Our first dance as a newly engaged couple. We danced on our favorite song “All the way” by Frank Sinatra and celine dion. And in the middle of the song, when it goes All the way.. Aashish lift me up and held me in the air and in that moment I felt like the luckiest girl in the world. For our engagement reception, we decided to wear navy blue in our outfits so we wanted to go with decor that compliments our outfits but does not blend in. So we decided on gold and white and just hints of navy blue. We had two speeches, one from the bride to be’s dad and one from the groom to be’s sister. We have two dance performances, one from the bride’s niece and nephew and one from the groom’s nieces. The most special performance was the one that aashish’s sister, Sejal and I planned to surprise Aashish. We danced on Baji Rao Mastani’s Deewani Mastani. Stay calm and enjoy every moment of planning and just remember how much you love each other. Do take your parents advice because it is a very special event for them as well. 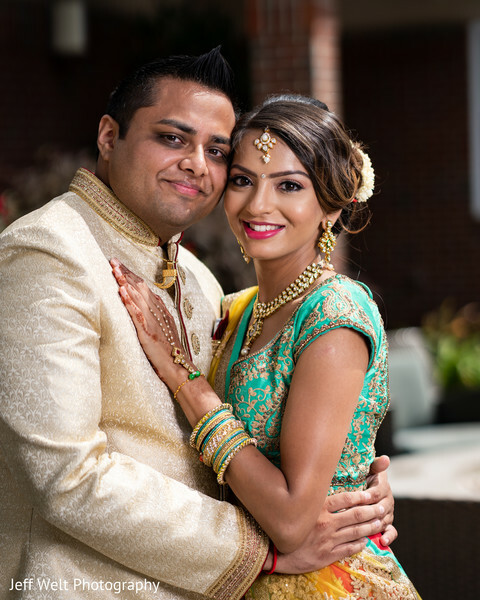 More to come of Gunjan & Aashish's special day! BEAUT by FAR and Aishas Wedding Decor are members of the Platinum Guide. Love what you see? Explore their portfolios.